When Vista was released most users were in doubt if their systems were meeting Windows Vista’s Requirements, then a Windows Vista Upgrade Advisor was made available to check for analysis.Similarly now if you are a Windows Vista or Windows XP and if you are in doubt and want to check if your PC meets the Windows 7 Minimum Requirements you can check that with Microsoft’s BETA version of Windows 7 upgrade Advisor that would analyze your system hardware. It is advisable to plug in any USB devices or other devices such as printers, external hard drives, or scanners that you regularly use so that the compatibility of such external devices can also be analyzed.It also suggest any driver upgrades if required and can be downloaded from Windows 7 Update. 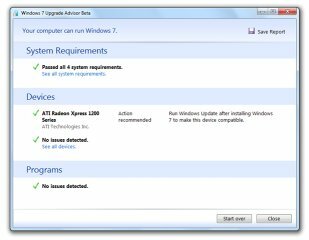 The Windows 7 Upgrade Advisor is compatible with Windows 7, Windows Vista and Windows XP. 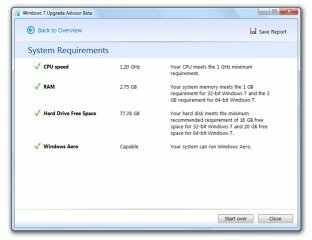 Windows 7 upgrade Advisor is free and is only available in English.